When astronomers go out and observe galaxies, they make measurements that don’t necessarily have much physical meaning on their own. Consider the most basic “observable” of any astronomical object: flux (usually reported in the oft-maligned magnitude system). Flux is related to the amount of energy being generated by a star (or an entire galaxy), but you can’t actually calculate the luminosity unless you also know how far away the star (or galaxy) is. Once you have luminosity, though, you can compare one object to another directly, and luminosity functions have been a valuable tool for understanding changes in galaxy populations for virtually as long as we’ve known about other galaxies. But is luminosity really the most fundamental property of a galaxy? There is other stuff in galaxies besides stars (which are responsible for much of a galaxy’s luminosity), so opinions are mixed. Some astronomers (like the authors of today’s paper) prefer to use the velocity dispersion of stars as a predictor of galaxy properties instead and have gone out and measured the velocity dispersion of a large number of individual galaxies in order to prove their point. The stellar velocity dispersion of a galaxy essentially measures the random line-of-sight motion of stars due to a the presence of mass (i.e., the gravitational potential well). Historically, velocity dispersion has played an major role in understanding galaxies and shows up in a number of important scaling relations, including the fundamental plane of elliptical galaxies (which has been used to estimate distances to elliptical galaxies as well as place constraints on their evolution) and the infamous M-sigma relation (which is nicely described in this astrobite). The origin of these scaling relations is still somewhat unclear, but one idea that is gaining momentum is that the mass of a galaxy’s dark matter halo is actually what determines many galaxy properties. Because stellar velocity dispersion probes the depth of the gravitational potential well in which the stars are sitting (which is dominated by dark matter), velocity dispersion also traces the properties of the dark matter halo; a paper from earlier this year claims that velocity dispersion is essentially the best metric to use, above other mass tracers like stellar mass or dynamical mass (which is itself determined using the velocity dispersion). The trouble is that you need a spectrum in order to measure velocity dispersion, since it is calculated from the width of absorption lines. This is a very difficult task, especially for faint objects, and so Rachel Bezanson and her collaborators used other galaxy properties which can be measured using images to infer the velocity dispersions of over 25,000 galaxies from redshift 1.5 down to 0.3 (i.e., back when the Universe was 4 to 10 billion years old). Dividing the galaxies in bins by redshift (i.e., time), they looked at the number density of galaxies as a function of velocity dispersion, which they call the velocity dispersion function (VDF). Figure 1 shows how the VDF changes with redshift for quiescent (or passive, non-star-forming) galaxies and star-forming galaxies. Figure 1: The evolution of the velocity dispersion function (VDF) for quiescent galaxies (left) and star-forming galaxies (right). The low velocity dispersion end of the quiescent VDF changes noticeably with redshift, but the VDF for star-forming galaxies stays essentially the same. Original figure from Bezanson et al. (2012). For both quiescent and star-forming galaxies, the number of galaxies at the highest end of the VDF changes very little as a function of time, which may suggest that these galaxies (and their dark matter halos) were already in place by redshift ~1.5 (only 4 billion years after the Big Bang!). The number of quiescent galaxies at the low end of the VDF increases with time, which could be explained if some star-forming galaxies suddenly stopped forming stars and became passive (astronomers sometimes call this “quenching”). The number of star-forming galaxies at all velocity dispersions stays roughly constant with time, but since some galaxies are presumably becoming quiescent, new galaxies must be taking their place. This could happen if star-forming galaxies’ velocity dispersions increased on the same timescale that galaxies were being quenched. The overall idea is that changes in the VDF are due to two competing processes: transformation and dissipation (see Figure 2). The former, transformation, occurs when a star-forming galaxy stops forming stars (why it does so is a different question!) and starts being counted as a quiescent galaxy. Dissipation refers to gas sinking to the center of a galaxy and causes the gravitational potential well to become deeper, therefore moving the galaxy to a higher velocity dispersion bin. Since these gas motions are more important in star-forming galaxies, the effect of dissipation is seen predominately in the VDF evolution of those galaxies. 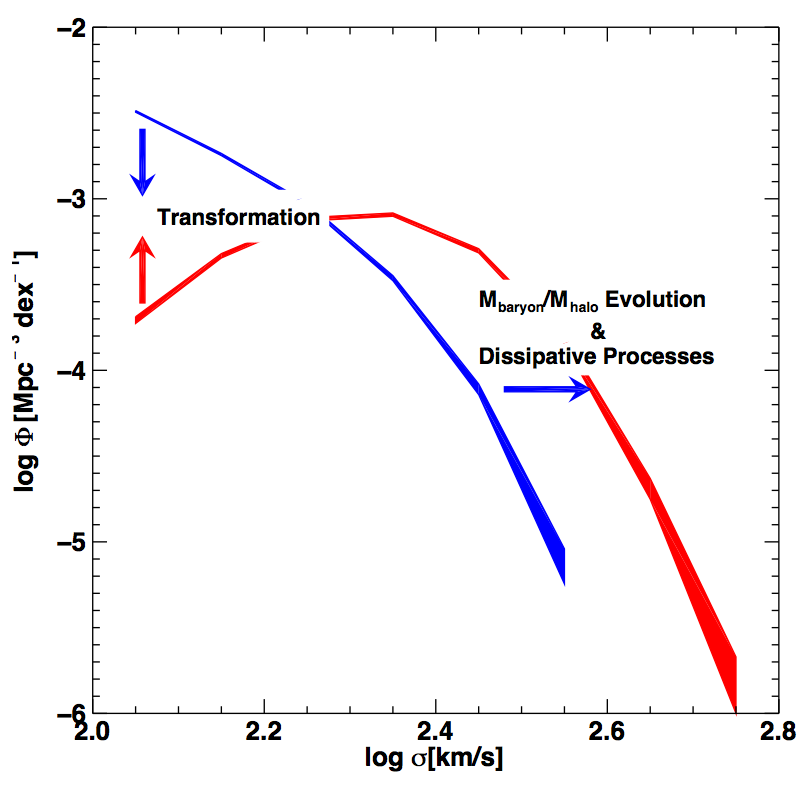 Figure 2: The effects of transformation and dissipative processes on the velocity dispersion functions (VDFs) of quiescent galaxies (red) and star-forming galaxies (blue). Original figure from Bezanson et al. (2012). The authors go on to model the effect of these two processes on the VDF and their results are strikingly similar to the observations (see Figure 8 in their paper!). At some level, however, this is not surprising and only serve to confirm what we already suspected. At late times (low redshift), star formation continues in galaxies with lower velocity dispersion, while the nearly all of galaxies with the highest velocity dispersions are already quiescent. Further, since velocity dispersion correlates with the mass of a galaxy’s supermassive black hole, the fixed high velocity dispersion end of the VDF suggests that the most massive black holes had already formed by redshift ~1.5, which is consistent with the fact that those same black holes accreted a significant fraction of their mass 1.5 billion years earlier, at redshift ~2. Both of these phenomena are related to the idea of “downsizing” or anti-hierarchical structure formation (basically the opposite of what we expect if galaxy formation is dictated only by gravity). Of course, there are still plenty of challenges left in explaining the underlying physics responsible for all of these observations. Putting together a complete picture of galaxy evolution will require continued efforts to understand the properties of individual galaxies and how those properties change as a function of redshift, which is exactly what Bezanson et al. have done. Very nice post! I especially liked the idea about how much still needs to be explained once you are able to measure more things!